We are passionate about giving our students the best possible advice and guidance for their futures. We provide this guidance through a variety of ways, including from our own highly trained and experienced staff along with making use of expertise from other organisations. We believe that students should have the opportunity to see the world of work; both within their curriculum providing real examples of work based activity and relevance, as well as being able to speak to people from across a diverse range of different work settings. Combined with the guidance provided within the curriculum, we use our ECO Days to help give intensive careers related guidance to students in Years 10 to 13. This includes visits to Universities and making use of our extensive connections to bring professionals into the Academy. We make use of online learning tools for careers related guidance, and have provided links here to specific sites which we believe are informative and suitable for young people thinking about their futures. Click on the images below to go to these websites. Please click here for the Redhill Trust Provider Access Policy. Please click here for the The Carlton Academy Careers Programme. A careers advice website designed to inform parents and carers about post-16 and post-18 options, student finances, gap years and much more. This is the main site offering information for people who are thinking about applying for an apprenticeship after leaving school. Students can register to search for jobs in their areas, and apply for vacancies through the website. We also have a copy of the apprenticeship guide in the library where students can find more information about apprenticeships in each career area. 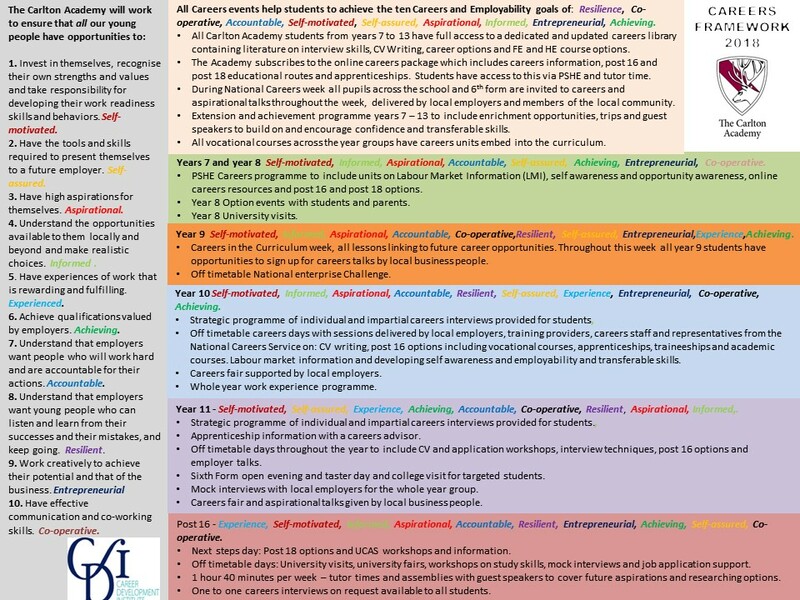 You can also download document with links to other excellent websites around Apprenticeships from here. The main website for University applications, including information about the courses offered by each university and their entry requirements.